No matter where he found himself prior to the start of the 2012-13 NHL season, Bryan Bickell often thought, ‘It’s going to be a good year.’ How right he was. Last summer, during one of his many fishing trips (read about that by clicking here), Bickell, the player who has become a Stanley Cup Playoffs standout figured the upcoming campaign would be a memorable one for both him and his Chicago teammates. He still had those same thoughts over the lockout when he played for Znojmo Orli in Austria. When training camp began, he felt the same enthusiasm. Now, one step away from hoisting hockey’s greatest team trophy aloft, he’s putting it all in perspective. After nine goals and 23 points in 48 regular season games, the 6’4”, 225-pounder has been a difference-maker in the playoffs. Bickell has eight goals, including two game-winners, and 13 points in 19 contests. The numbers are far from modest, but the man behind them most certainly is. Bickell’s only too happy to contend with the countless phone and text messages that await him after each game, including the ones that come from friends and family in his hometown of Orono. Located on the southern stretch of Highway 35/115, about 45 minutes east of Toronto, and 973 miles from Chicago, Orono is where Bickell’s mom and dad still call home. It’s also where his biggest fan base, outside of the Windy City, resides. When the ‘Hawks won it in 2010, Bickell didn’t meet the criteria to get his name engraved on the trophy. But it didn’t prevent him from bringing it back home. Though he now calls Peterborough (just 40 minutes from Orono) home in the off-season, Bickell often returns to see his family and friends. 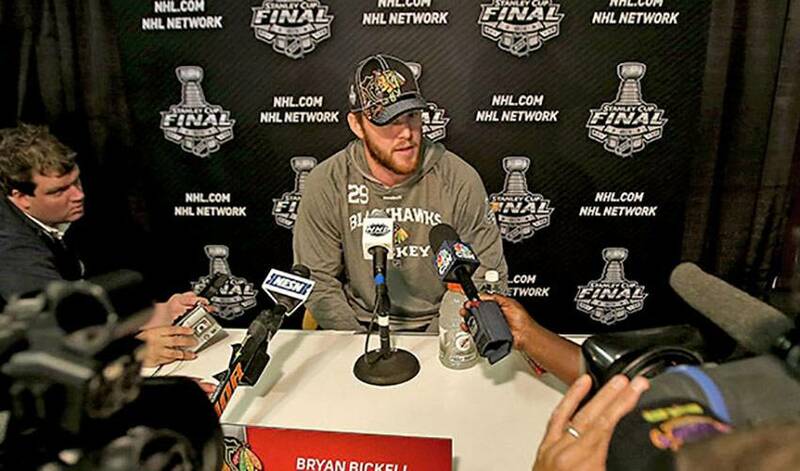 And when he’s not scoring key goals in the playoffs, Bickell is by no means a man about town. But he’s happy to put his hobby on hold, at least for a little longer. Like reeling in a 34.5-pound silver trophy, perhaps? “That would definitely be it,” Bickell said with a laugh.